Jump ahead a half-century and Municipal’s longstanding run with college basketball is seeing a resurgence. The Missouri-Kansas City Kangaroos began playing home games at the arena when they became a Division I program in 1987-88. The ‘Roos stayed there until 2010-11 when they were forced to move on campus due to increased rental costs and declining ticket sales, according to UMKC Sports Information Director Rob McCutcheon. This largely shuttered Division I basketball’s nearly century-old relationship with Municipal. But “major change” was the theme for UMKC’s basketball program this past offseason. The ‘Roos moved from the Summit League to the reconfigured WAC and replaced head coach Matt Brown with Louisville assistant Kareem Richardson. With this change came a return to Municipal, which underwent $5 million in renovations that included new video boards and upgrades to the seating, lighting and sound system. Municipal Auditorium got a $5 million facelift this past offseason (kcstudio.org). Long ago Municipal served as a launching pad of sorts for blue-blooded programs UCLA and North Carolina, at least in terms of championships. On a much smaller scale, UMKC certainly hopes the arena can help launch its program into the WAC’s upper tier. On Saturday night, Richardson picked up the biggest win of his young tenure, as the ‘Roos (6-11, 3-2) knocked off New Mexico State (14-7, 3-2), the conference’s heavy preseason favorite and a team that already owns wins at New Mexico and UTEP. Attendance was spotty, but the old arena came alive with under a minute to go as senior Nelson Kirksey broke a tie with a mid-range jumper. Marvin Menzies got a career-night from senior Renaldo Dixon (33 points), but it was necessary because UMKC did a good job not letting WAC preseason Player of the Year Daniel Mullings drive to the basket (three points on 1-of-11 shooting). 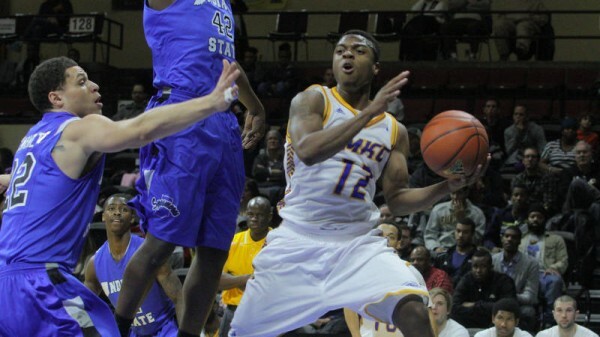 Freshman Martez Harrison is the type of local athlete UMKC coach Kareem Richardson will need to build around (umkckangaroos.com). Martez Harrison won the game with a pair of free throws with four seconds left after an inexplicable foul by Mullings. Harrison is the type of the player Richardson can use to bring excitement back into Muncipal’s venerable old bones. The freshman guard is a local product who played his prep basketball at Brewster Academy in New Hampshire, but decided to return home despite offers from Southern Illinois and St. Bonaventure. He’s the type of dynamic, quick athlete who could excel in the up-tempo Rick Pitino-style system. Richardson can use that style of play as a key recruiting tool, as well as the ring he won sitting by Pitino’s side with the Cardinals last season. Having one of the most historic venues in the country as a home court advantage can’t hurt either. This entry was posted on Sunday, January 19th, 2014 at 2:45 pm by Greg Mitchell (@gregpmitchell)	and is filed under microsites, other 26. Tagged: bob knight, daniel mullings, feature, jerry lucas, john wooden, Kareem Richardson, Martez Harrison, marvin menzies, Municipal Auditorium, Nelson Kirksey, new mexico state, umkc, wilt chamberlain. You can follow any responses to this entry through the RSS 2.0 feed. You can leave a response, or trackback from your own site. Thanks so much for this. There’s so much great basketball history there and a big reason that the sport is so popular in that part of the country. Had no idea Municipal had this kind of History. Really cool.